Summary: The goal of this project is to quantify the fine-scale behavior, and relative energy expenditure of loggerhead sea turtles during their nesting season, using novel acceleration-depth-temperature data loggers (ADLs). These devices measure turtle swimming movements, body posture, and energy expenditure on a second-by-second basis, and thereby allow us to track how these animals utilize their time and energy throughout the nesting season. The simultaneous application of satellite tags will also allow us to precisely map where the turtles are spending their time and energy. Although previous accelerometer-based studies have been limited in duration by the memory of the tags, newly available devices will allow us to monitor the animals every second for several weeks, obtaining energy budgets throughout the inter-nesting period for the first time ever. This will allow us to determine how the behavior of the animals changes to maximize reproductive output (number of eggs laid) at different temperatures (waters in the Northern Gulf of Mexico versus the Florida Keys), as well as how reproductive output is affected by non-nesting emergences (i.e., false crawls). The fine-scale data from ADLs allows for detection of false crawls, and also gives us the ability to quantify the increased energy use associated with them. Data from real-time satellite tags (funded by USGS) will allow all activities to be precisely mapped to specific locations. Results: We have tagged 36 adult female loggerheads with acceleration data logger (ADL) tags during their nesting season, 16 in the Dry Tortugas (DRTO) and 20 in the Northern Gulf of Mexico (Baldwin County, Alabama and Northern Florida). 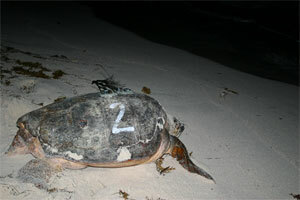 We have recaptured 18 of these turtles after one or more inter-nesting periods, and recovered the data from their tags. The tags from these 18 animals have recorded more than 310 days of behavioral and energetic data sampled at sub-second intervals, averaging 17.2 days per turtle and encompassing 33 nesting events and 34 false crawls. The accelerometers deployed in the last year were expected to record for 45-60 days based on specifications from their manufacturer, Wildlife Computers. However, these tags ran out of battery after much shorter periods, failing after only a few days in some cases. Wildlife Computers has acknowledged this problem and replaced all of these accelerometers with a newer model that has a longer life expectancy, however most of these tags were just received in October, so they have not yet been deployed. Because of this, as well as the number of accelerometers still at large, we have not fully analyzed our data or submitted our results for publication (tasks 7 and 8). However, we are optimistic that both of these tasks will be completed in the next year as we recover more of our accelerometers, still being actively tracked via satellite tags, and re-deploy the longer lasting accelerometers provided by Wildlife Computers. The depth and acceleration profiles and the satellite tag data recovered from these turtles show significant variability in their diving habits and movement patterns during inter-nesting periods. Based on previous research, nesting turtles are thought to stay relatively close to shore and near their nesting locations during the nesting season in order to conserve energy. Some of our turtles adhered to these patterns, staying relatively shallow, conducting almost exclusively resting U-dives, and staying close to their nesting location. However, other turtles showed more variable diving and movement behavior between nesting events, in some cases diving up to more than 100 m deep and traveling almost 400 km away from their nesting locations. There was also variability in the number of false crawls conducted among individual turtles, with some turtles false crawling up to seven times in between nesting events while other turtles did not show any false crawls. These different energetic choices have the potential to significantly affect the reproductive output of these turtles during the nesting season. Further analysis of our ADL and satellite data may elucidate the proximate causes of these choices. For example, it is possible that turtles traveling long distances during the nesting season do so in order to find better feeding grounds and replenish their energy stores, while turtles staying near shore rest as much as possible to avoid expending energy and therefore do not need to feed as much.